"So these 3 groups - the crowd, the disciples and the remnant at Calvary - represent the stages of the Christian life. As we accompany Christ to Calvary, our souls are rooted in faith, purified in hope and perfected in love. This is not an easy path, as Jesus had warned James and John "Are you able to drink the chalice that I am to drink?" Not everyone is willing to follow this path straight away and God in His mercy will often make the offer again." "Brothers and Sisters, Good Morning! I am glad to welcome you to my first General Audience. With deep gratitude and reverence I take up the “witness” from the hands of Benedict XVI, my beloved Predecessor. 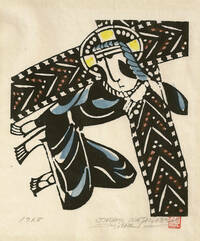 After Easter we shall resume the Catecheses for the Year of Faith. Today I would like to reflect a little on Holy Week. We began this Week with Palm Sunday — the heart of the whole Liturgical Year — in which we accompany Jesus in his Passion, Death and Resurrection. But what does living Holy Week mean to us? What does it mean to follow Jesus on his pathway on Calvary towards the Cross and the Resurrection? In his earthly mission Jesus travelled the roads of the Holy Land; he called twelve simple people to stay with him, to share his journey and to continue his mission. He chose them from among the people full of faith in God’s promises. He spoke to all without distinction: the great and the lowly, the rich young man and the poor widow, the powerful and the weak; he brought God’s mercy and forgiveness; he healed, he comforted, he understood; he gave hope; he brought to all the presence of God who cares for every man and every woman, just as a good father and a good mother care for each one of their children. God does not wait for us to go to him but it is he who moves towards us, without calculation, without quantification. That is what God is like. He always takes the first step, he comes towards us. Jesus lived the daily reality of the most ordinary people: he was moved as he faced the crowd that seemed like a flock without a shepherd; he wept before the sorrow that Martha and Mary felt at the death of their brother, Lazarus; he called a publican to be his disciple; he also suffered betrayal by a friend. In him God has given us the certitude that he is with us, he is among us. “Foxes”, He, Jesus, said, “have holes, and birds of the air have nests, but the Son of man has nowhere to lay his head” (Mt 8, 20). Jesus has no house, because his house is the people, it is we who are his dwelling place, his mission is to open God’s doors to all, to be the presence of God’s love. In Holy Week we live the summit of this pathway, of this plan of love that travels the whole history of the relations between God and humanity. Jesus enters Jerusalem to take his last step with which he sums up the whole of his existence. He gives himself without reserve, he keeps nothing for himself, not even life. At the Last Supper, with his friends, he breaks the bread and passes the cup round “for us”. The Son of God offers himself to us, he puts his Body and his Blood into our hands, so as to be with us always, to dwell among us. And in the Garden of Olives, and likewise in the trial before Pilate, he puts up no resistance, he gives himself; he is the suffering Servant, foretold by Isaiah, who empties himself, even unto death (cf. Is 53:12). Jesus does not live this love that leads to his sacrifice in a passive way or as a fatal destiny; of course he does not conceal his deep human perturbation in front of violent death, but with full confidence he entrusts himself to the Father. Jesus gave himself up to death voluntarily in order to reciprocate the love of God the Father, in perfect union with his will, to demonstrate his love for us. On the Cross Jesus “loved me and gave himself for me” (Gal 2:20). Each one of us can say: “he loved me and gave himself for me”. Each one can say this “for me”. What does all this mean for us? It means that this is also my, your, our road. Living Holy Week, following Jesus not only with the emotion of the heart; living Holy Week, following Jesus means learning to come out of ourselves — as I said last Sunday — in order to go to meet others, to go towards the outskirts of existence, to be the first to take a step towards our brothers and our sisters, especially those who are the most distant, those who are forgotten, those who are most in need of understanding, comfort and help. There is such a great need to bring the living presence of Jesus, (who is) merciful and full of love! Living Holy Week means entering ever more deeply into the logic of God, into the logic of the Cross, which is not primarily that of suffering and death, but rather that of love and of the gift of self which brings life. It means entering into the logic of the Gospel. Following and accompanying Christ, staying with him, demands “coming out of ourselves”, requires us to be outgoing; to come out of ourselves, out of a dreary way of living faith that has become a habit, out of the temptation to withdraw into our own plans which end by shutting out God’s creative action. God came out of himself to come among us, he pitched his tent among us to bring to us his mercy that saves and gives hope. Nor must we be satisfied with staying in the pen of the 99 sheep if we want to follow him and to remain with him; we too must “go out” with him to seek the lost sheep, the one that has strayed the furthest. Be sure to remember: coming out of ourselves, just as Jesus, just as God came out of himself in Jesus and Jesus came out of himself for all of us. Someone might say to me: “but Father, I don’t have time”, “I have so many things to do”, “it’s difficult”, “what can I do with my feebleness and my sins, with so many things?” We are often satisfied with a few prayers, with a distracted and sporadic participation in Sunday Mass, with a few charitable acts; but we do not have the courage “to come out” to bring Christ to others. We are a bit like St Peter. As soon as Jesus speaks of his Passion, Death and Resurrection, of the gift of himself, of love for all, the Apostle takes him aside and reproaches him. What Jesus says upsets his plans, seems unacceptable, threatens the security he had built for himself, his idea of the Messiah. And Jesus looks at his disciples and addresses to Peter what may possibly be the harshest words in the Gospels: “Get behind me Satan! For you are not on the side of God, but of men” (Mk 8, 33). God always thinks with mercy: do not forget this. God always thinks mercifully. He is the merciful Father! God thinks like the father waiting for the son and goes to meet him, he spots him coming when he is still far off.... What does this mean? That he went every day to see if his son was coming home: this is our merciful Father. It is the sign that he was waiting for him with longing on the terrace of his house. God thinks like the Samaritan who did not pass by the unfortunate man, pitying him or looking at him from the other side of the road, but helped him without asking for anything in return; without asking whether he was a Jew, a pagan or a Samaritan, whether he was rich or poor: he asked for nothing. He went to help him: God is like this. God thinks like the shepherd who lays down his life in order to defend and save his sheep. Holy Week is a time of grace which the Lord gives us to open the doors of our heart, of our life, of our parishes — what a pity so many parishes are closed! — of the movements, of the associations; and “to come out” in order to meet others, to make ourselves close, to bring them the light and joy of our faith. To go out always! And to do so with God’s love and tenderness, with respect and with patience, knowing that God takes our hands, our feet, our heart, and guides them and renders all our actions fruitful. I hope that we all will live these days well, following the Lord with courage, carrying in ourselves a ray of his love to all those we encounter." "Je salue avec joie les pèlerins francophones, en particulier ceux de France et du Canada ! Notre monde a besoin de la présence vive de Jésus miséricordieux et riche d’amour. Je vous invite tous à bien vivre cette Semaine Sainte en suivant le Seigneur avec courage et en portant un rayon de son amour à ceux que vous rencontrerez. Bonne fête de Pâques ! Heartfelt greetings to the English-speaking pilgrims, especially the large group of university students taking part in the international UNIV Congress here in Rome. I extend a warm welcome to the pilgrims from England, Ireland, the Philippines and the United States of America. I invite all of you to enter fully into the spirit of Holy Week, following in the footsteps of Jesus and bringing the light of his love to everyone you meet. Happy Easter! Ganz herzlich grüße ich alle Brüder und Schwestern aus den Ländern deutscher Sprache. Besonders in diesen österlichen Tagen können wir Gottes Nähe erfahren, wenn wir uns auf ihn einlassen, wenn wir sein Wort aufmerksam hören und sein Erbarmen im Sakrament der Beichte und der in Eucharistie empfangen. Ich wünsche uns allen, dass wir diese Tage mit Hingabe feiern und unsere Mitmenschen mit einem Strahl der Liebe Gottes beschenken. Frohe Ostern euch allen! Saludo cordialmente a los peregrinos de lengua española, en particular a los grupos provenientes de España, Argentina, México y los demás países latinoamericanos. Invito a todos a vivir estos días siguiendo al Señor con fortaleza y siendo capaces de irradiar su amor a cuantos encontremos en el camino de la vida. Que Dios los bendiga y les conceda vivir el Triduo Pascual con fe y devoción. Queridos peregrinos de língua portuguesa, particularmente os grupos de jovens vindos de Portugal e do Brasil: sede bem-vindos! Desejo-vos uma Semana Santa abençoada, seguindo o Senhor com coragem e levando a quantos encontrardes o testemunho luminoso do seu amor. A todos dou a Bênção Apostólica! الحجاج الأحباء الناطقون باللغة العربية وفي الشرق الأوسط: "لا تخافوا" من السير بشجاعة خلف يسوع المصلوب والقائم، حاملين للجميع فرح ونور ايمانكم. اسبوع آلام مقدس. ولكم جميعا أمنح البركة الرسولية! Pozdrawiam polskich pielgrzymów. Drodzy bracia i siostry, jutro rozpoczynamy Triduum Sacrum. W liturgii będziemy na nowo przeżywali tajemnice męki, śmierci i zmartwychwstania naszego Pana Jezusa Chrystusa. Starajcie się w tych dniach wchodzić z coraz większą wiarą w Bożą logikę, w logikę Krzyża, która nie jest przede wszystkim logiką cierpienia i śmierci, ale miłości i darowania siebie, przynoszącą życie. Niech Bóg wam błogosławi! Rivolgo un cordiale benvenuto ai pellegrini di lingua italiana. In particolare, saluto gli universitari che partecipano all’incontro internazionale promosso dalla Prelatura dell’Opus Dei. Cari amici, siete venuti a Roma in occasione della Settimana Santa per un’esperienza di fede e di arricchimento spirituale. Vi ringrazio per la vostra preghiera e per il vostro affetto al Papa. Con la vostra presenza nel mondo universitario, ognuno di voi possa realizzare quanto auspicava San Josemaria Escrivá: «è in mezzo alle cose più materiali della terra che ci dobbiamo santificare, servendo Dio e tutti gli uomini» (Colloqui, n. 13). Saluto i fedeli della diocesi di Firenze e i numerosi studenti di varie scuole. Tutti ringrazio per questa visita, augurando a ciascuno che i giorni della Settimana Santa siano occasione propizia per rafforzare la fede e l'adesione al Vangelo. Rivolgo infine il mio cordiale pensiero ai giovani, agli ammalati ed agli sposi novelli. La contemplazione della passione, morte e risurrezione di Gesù, cari giovani, vi renda sempre più saldi nella testimonianza cristiana. E voi, cari ammalati, traete dalla Croce di Cristo il sostegno quotidiano per superare i momenti di prova e di sconforto. A voi, cari sposi novelli, venga dal mistero pasquale, la grazia per fare della vostra famiglia un luogo di amore fedele e fecondo." "Seguo con attenzione quanto sta accadendo in queste ore nella Repubblica Centroafricana e desidero assicurare la mia preghiera per tutti coloro che soffrono, in particolare per i parenti delle vittime, i feriti e le persone che hanno perso la propria casa e che sono state costrette a fuggire. Faccio appello perché cessino immediatamente le violenze e i saccheggi, e si trovi quanto prima una soluzione politica alla crisi che ridoni la pace e la concordia a quel caro Paese, da troppo tempo segnato da conflitti e divisioni."